A fugitive task force in Oklahoma tracked down a pastor accused of having s*x with an underage girl. Damien Bonner, a senior pastor at Galilee Baptist Church, was arrested on six counts of lewd mοlestation. Owasso police said that the victim was a 15 year old who was friends with the pastor’s children. According to investigators, church members are siding with the pastor and not cooperating with police. The teenaged girl came forward last month and accused the pastor of abusing her. 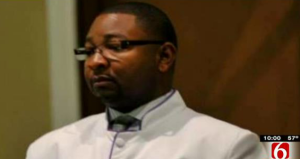 Police reportedly confirmed with that both the pastor and the girl sent unclad texts to one another. “An inappropriately close relationship between an adult and child,” said Jason Woodruff with the Owasso Police. Woodruff says the alleged abuse occurred at Bonner’s apartment but began at the church. “He had bought her a cell phone, and bought her clothes and things like that, in an attempt to gain that trust and then took advantage of that trust,” Woodruff said. “We don’t want to live in a society where you can’t trust anyone, but keep your eyes open, look for the warning signs, look for if that relationship goes beyond just a mentor or a friendship type relationship,” Woodruff warned. Bonner was apprehended by the Northern Oklahoma Viοlent Crimes Task Force around 5:20 p.m. Wednesday. He is being held on $300,000 bail.